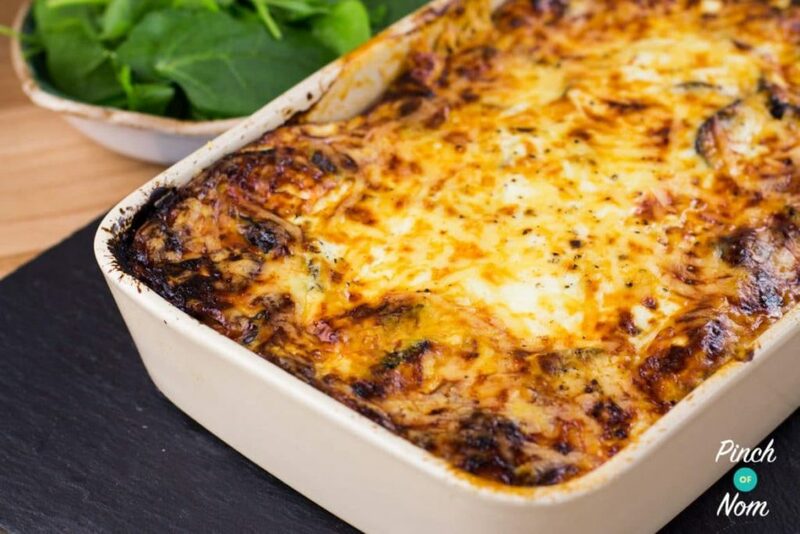 This Moussaka recipe is a rich, delicious meal for anyone counting calories or following plans like Slimming World and Weight Watchers! Now, before we get to the recipe for this Moussaka, we know that this Greek classic traditionally contains minced lamb and this contains diced lamb. But there is a reason! If you’ve ever checked, you’ll know that most lamb mince is pretty high in calories, Syn and Point values. 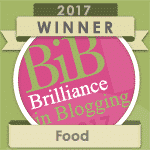 This is because it is difficult to find lamb mince with a very low fat content. As we wanted to make something that is completely Syn Free for those following Slimming World, we thought we’d just use some finely diced lamb, with all the fat removed. This Moussaka may take a little time to prepare, but it’s definitely worth the effort! There are many different ways to make a lighter, more slimming friendly white sauce to use for dishes like this one. Some use cottage cheese blitzed in a food processor, some use quark or you could go a more traditional route and make it with milk and cornflour. All three of these methods have their downsides. If you’re using cottage cheese or Quark then there is a risk of the sauce splitting or curdling when it’s heated. If you use milk and cornflour you are increasing the calories, Syns and Points. That’s why we use fat free yogurt and eggs for the sauce. It holds up surprisingly well when it’s heated, and if you add half a teaspoon of mustard powder it will give a ‘cheesier’ flavour to the sauce. How many calories is this Moussaka recipe? There are only 365 calories per portion of this Moussaka! How Slimming World friendly is this Moussaka recipe? The only thing that could cost you Syns in this recipe is the white sauce. Everything else is completely Syn Free. If you want to Syn the cheese each portion will be 3 Syns. If you are using the cheese as one of your Healthy Extra A options then you will be using half of one HEA allowance. How Weight Watchers friendly is this Moussaka recipe? 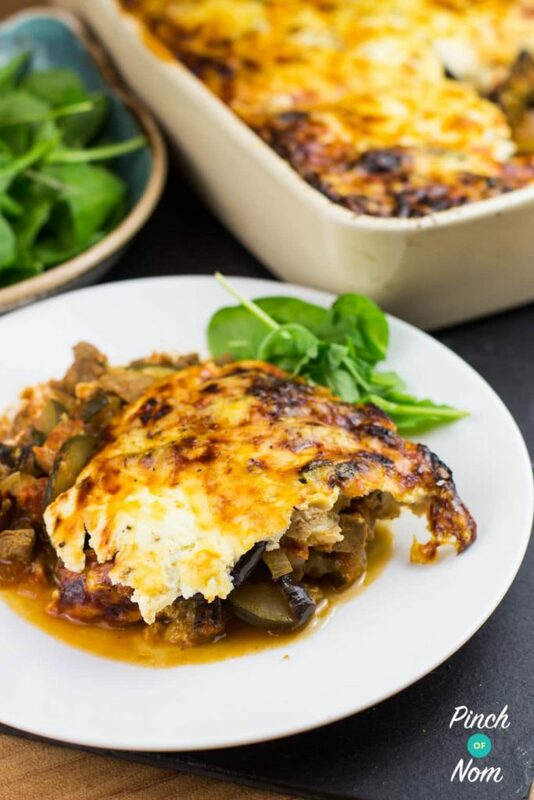 This Moussaka recipe is an incredible 5 Points per portion, so you can enjoy it guilt free! What do I need to make this Moussaka recipe? You’ll need an oven proof dish similar to this one. So if you’ve haven’t got one lurking in the cupboard you can pick one up from Amazon. Don’t worry if this Moussaka makes your shiny new oven dish a bit grubby. We’ve discovered Fizz Express, which waves good bye to to the overnight soak, and no more scrubbing. Hurrah! Fizz Express is the first ever hand dishwashing solution that removes stubborn burnt on food and stains in just 5 minutes! How does Fizz Express work? All you do is fill your dirty dish with hot water and drop in a Fizz Express tablet. After 5 minutes, empty the dish and give it a quick clean with the sponge scourer (included in the box), and et voila! We were a little dubious about how well these would work, but as you can see in the video they really do work! What’s in the Fizz Express Box? 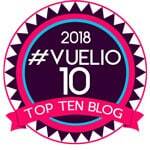 You get a sponge scourer (which is the nations favourite) and 15 solid effervescent tablets. Which is pretty good value for money in my book. You can get them from Tesco, Waitrose, Amazon & Ocado! 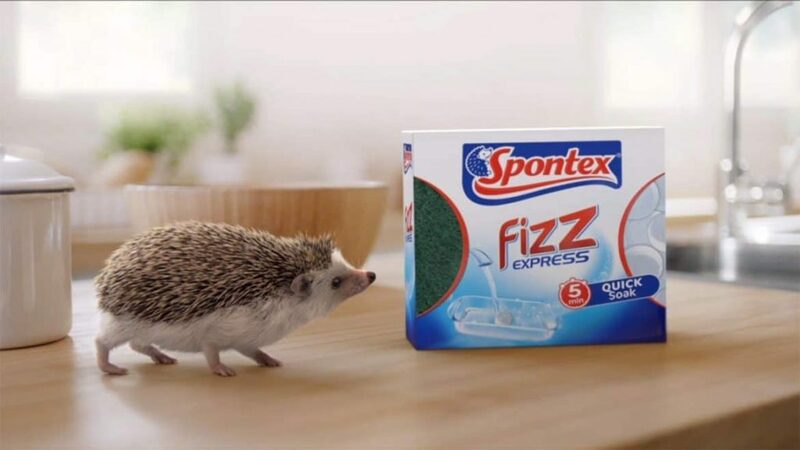 You can even get them from Spontex directly. Love this Moussaka recipe? Tag us! How about some more comforting recipes? Come join our Facebook group! We have over 701,000 members, who want to help you! You wouldn’t want to miss out on the fun would you? Mist a decent sized pan with low calorie cooking spray, then add onions and sauté, until they start to soften and colour. Leave your dirty dishes to soak overnight Fill your dirty dish with hot water and drop in a Fizz Express tablet. After just 5 MINUTES empty and give the dish a quick clean and et voila! This looks lovely – going to try it with quorn mince. Have you tried freezing it? Would you freeze it once it’s all cooked just as a quick re-heat meal or before the final bake? I’m the only one in the family who eats aubergine!! I can’t see onions in the ingredients list but they’re in the method – is it me?! Cannot WAIT to eat this!! I’ve just made this for dinner. Astonishingly good! The only changes I made were to salt the aubergines first for 10mins, rinse, then griddle both aubergines and courgettes, rather than grill them, to bring out the natural sugar content and apply a pretty lined appearance from my pan. I was surprised at the yogurt and egg mix which I sprinkled with Parmesan. It turned into a lovely cheesy, slightly crunchy top and I’ll try it on cauliflower next time. Would you be able to freeze this? Onions mentioned in method but not list of ingredients! Presume it’s one. 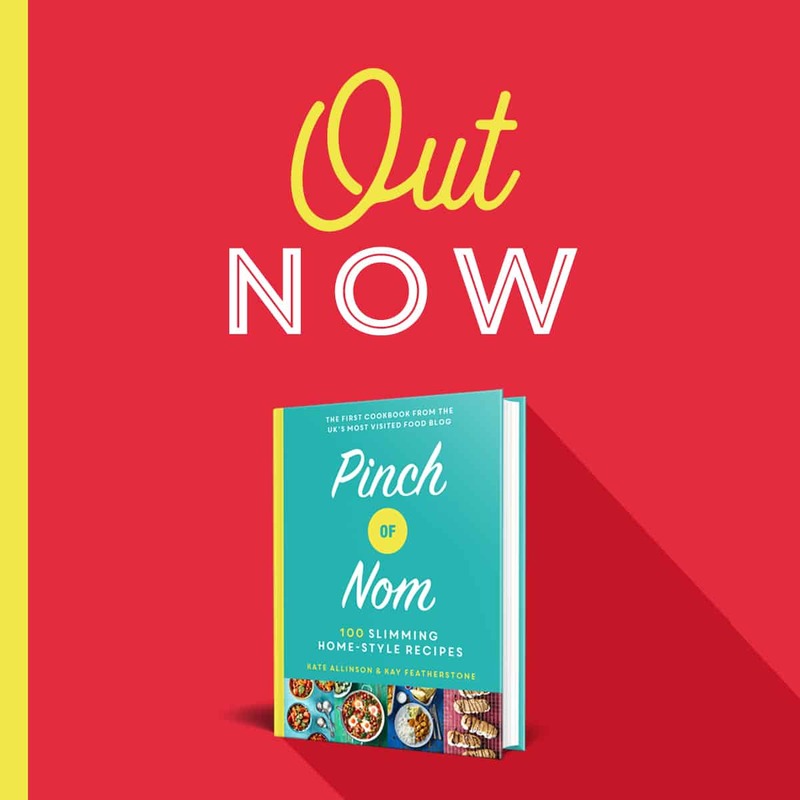 Well spotted – I’ve updated the recipe to include an onion! Very tasty and I’d say well enough to serve 8 served with a jacket potato and salad. I salted the aubergines too. There was quite a lot of watery juice at the bottom of the dish though which I will have to drain off before I freeze. So glad you enjoyed it. Grilling/griddling the aubergine should help to reduce the liquid. Just made this for dinner, didn’t use courgettes as I didn’t have any. Replaced meat with green lentils and added mushrooms, lovely recipe thanks! Sounds delish! So glad you enjoyed it!